Simple Tofu Broccoli Bowl is a healthy meal that you can make in the oven or in the air fryer. Serve over quinoa with a pesto drizzle for an easy supper in less than an hour! This is another recipe for my awesome sponsors at EZ Tofu Press, and it’s definitely a favorite in my house. 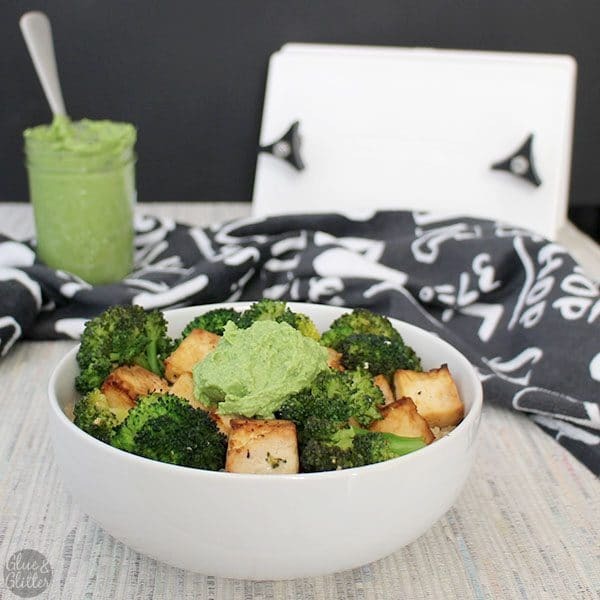 You can actually top this Tofu Broccoli Bowl with any sauce you like, which is what my family likes about it. I pour on the pesto, my son uses vegan mayo, and my husband like his with just a little bit of soy sauce on top. Choose your own saucy adventure! I’ve been trying to perfect air fried broccoli for ages, and I think the trick is to pre-cook the broccoli, like Emeril recommends. The cool thing about his cooking method is that 400F for 15 minutes also works great for roasting tofu in the air fryer. Boom! You don’t need an air fryer to make this recipe, though. That pre-boiling actually works great for roasted broccoli, too, though it’s optional. 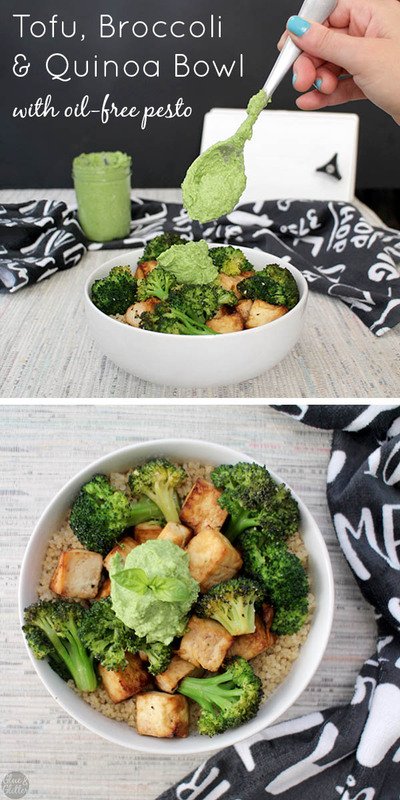 I have instructions for a baked or an air friedTofu Broccoli Bowl below, so you can do what works best for you. 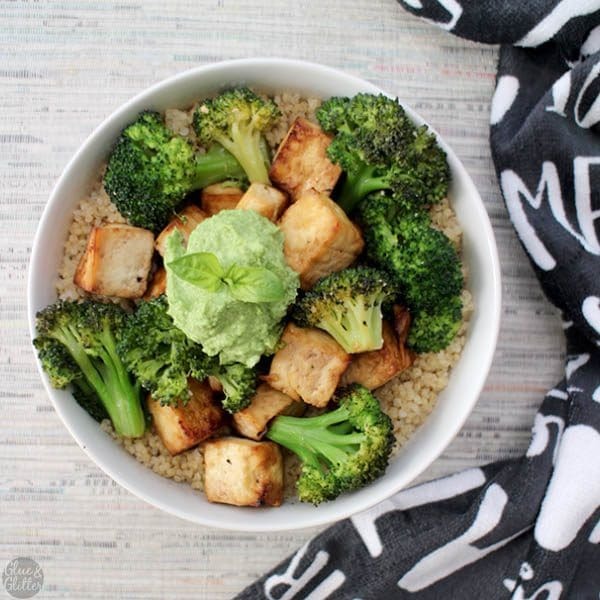 Like with almost any tofu recipe, pressing the tofu for this Tofu Broccoli Bowl makes a big difference in both taste and texture. Pressing your tofu gives it a more toothsome texture, and in this case it also gets the water out, so you can get more marinade in. 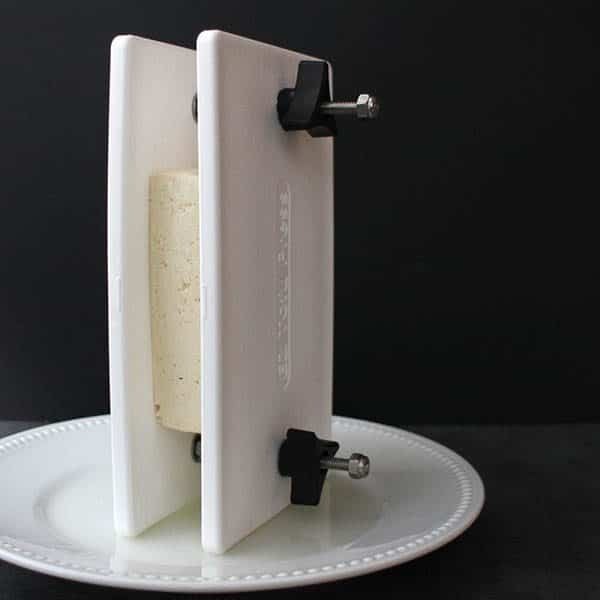 You can use other methods to press tofu, but I love how the EZ Tofu Press presses my tofu quickly, evenly, and without any crumbling. You can see in the video demo that the EZ Tofu Press gets a shocking amount of water out of your block of tofu, and that completely transforms the texture and its ability to soak up your marinade of choice. Got that tofu pressed and ready to go? Let’s cook! 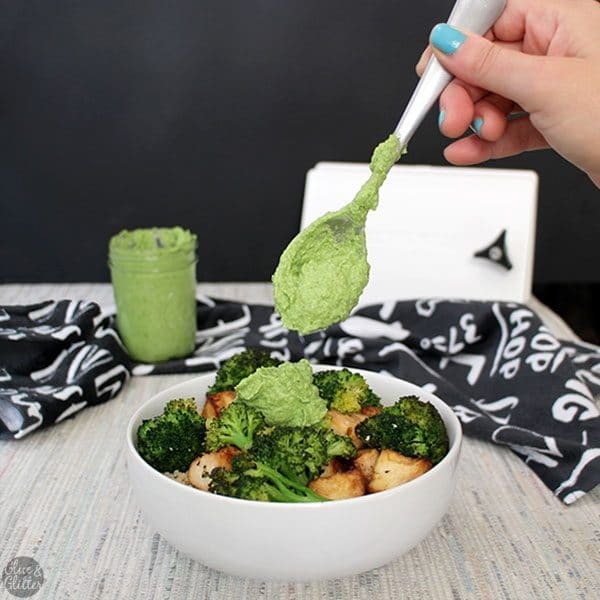 1 batch Oil Free Avocado Pesto - You can make this while the tofu and broccoli cooks. You can also use any sauce you like, if pesto isn't your thing. In a large shallow dish, toss together the tofu cubes, 1 tablespoon of olive oil, soy sauce, and vinegar. Set aside to marinate for at least 20 minutes. If you're cooking your tofu and broccoli in the oven, preheat it to 400F now. While the tofu marinates and the oven preheats, cook the quinoa with the 1 1/4 cups water using your favorite method. I have lots of quinoa cooking options outlined here! I prefer my pressure cooker, since it's so easy and quick. In a small pot, heat the 4 cups water on high, and bring it to a boil. Drop in the broccoli florets, and cook for 2 minutes. Do not bring them back to a boil, start them timer as soon as the broccoli hits the water. Transfer cooked broccoli to a colander to drain, rinsing with cold water to stop it from cooking. Oven Directions: Toss the broccoli with the other tablespoon of olive oil and the tofu + any marinade left in the bowl. Transfer the tofu-broccoli mixture into an 8x8" glass baking pan. Cook for 30-40 minutes, stirring every 10 minutes, so that everything cooks evenly. For that last, optional 10 minutes, you'll want to stir every 5 minutes, checking the broccoli for doneness. Whether you cook for the extra time depends on how crispy you like your broccoli. Air Fryer Directions: Transfer the tofu into your air fryer basket, reserving any leftover marinade. Cook at 400F for 10 minutes, shaking after 7 minutes. Meanwhile, toss the broccoli with the leftover marinade from the tofu bowl. When the 10 minute cooking time is up, add the broccoli to the tofu mixture, and air fry for 5-7 more minutes at 400F. Divide the cooked quinoa between 4 serving bowls. Top with the tofu-broccoli mixture. You can drizzle with the pesto now, or let folks do that right at the table. Oh man. I’ve only made it from scratch a couple of times. It took all day!